A record of the process from recommendation to conclusion. All the background to this process can be found in the Port Royal Thoughts section under the Background Reading heading on the navigation menu. The Structural Engineer’s Report is available if you create an account, this account will not sign you up to the Newsletter or be used in any way except as a record of who has viewed the report. A change in text colour usually indicates a link to further information. EDDC is East Devon District Council; JLL is the marketing firm; STC is Sidmouth Town Council. The news has been released that there are 3 bidders for the Drill Hall. None of these is a Community Bid as I have verified elsewhere. And it has been reported in the Sidmouth Herald. 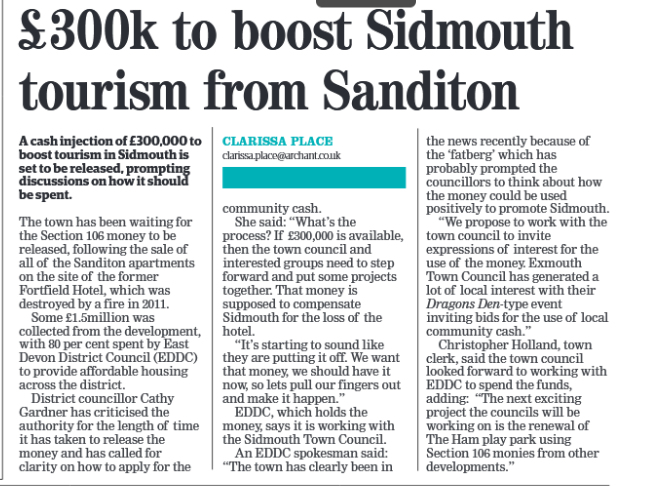 EDDC have also announced through the Sidmouth Herald £300,000 for tourism in Sidmouth, from money made from the Sanditon development. Most of the money from Sanditon has been spent elsewhere in East Devon but we are permitted this much. Perhaps it could have been spent on the Drill Hall? A functioning building in place of a neglected one would be good for tourism. Marketing has now finished and the bids are in. The Drill Hall sale has been opened to commercial bidders. JLL has issued the sales particulars. Download sales details pdf. The Sidmouth Sunrise Community Bid, being put together by Gillian Mitchell and her other directors, can be contacted through their FaceBook page. Drill Hall Rescue has decided to put all its resources behind the Sidmouth Sunrise efforts to create a Community Bid. read more …. Things are looking more positive. We are getting good communication through John Kinsey of JLL and more and more people are coming forward with offers of practical help. After questions about previous surveys being asked for weeks JLL has passed on a survey (supplied to them by EDDC ) which took place in 2011. EDDC have previously denied that any previous survey took place. You can read a denial given in a response to a Freedom of Information request here at ‘what do they know.com‘. Please note that not only did EDDC initially say that there were no surveys done but that they have now over-run the time by which they were legally required to provide an accurate answer to an FOI. This is typical of the problems we have encountered while trying to work with EDDC, they provide information only grudgingly and more often than not it is misleading and incomplete. The formal notice marking the beginning of the sales period for the Drill Hall has now appeared in the Sidmouth Herald. The closing dates for bids will be 4th Feb 2019. EDDC and JLL have had to put back the starting date as they were not able to supply Community Bid groups with the access to the hall and the sales details which were promised. As can be seen by their scruffy and unprofessional display on the Drill Hall door they still do not seem to have got their act together. This display has not been put up by a community group, these groups can do a much better job; they have to if they want people to take them seriously! Yesterday I had an accompanied viewing of the Drill Hall, along with some others. The earlier interior photographs for 2013 and 2017 have now been joined by some photographs of details. I have received the report from last week’s survey which I have put on a membership page. I have done this so I can keep a record of those who view it. For the first 3 months of the sales period EDDC have instructed JLL to restrict the information available to commercial parties; and so I feel an obligation to at least try to know if anyone with a commercial interest accesses the report. If you register for membership and receive access please don’t share that access but instead encourage people to sign up personally. I can use the sign-up list as evidence of people’s interest in the Drill Hall being retained. My Structural Engineer will be doing the survey of the Drill Hall today and will try to get the report to me by the end of next week. John Kinsey wrote to me at 12.48 yesterday lunch time but I didn’t find it until last night. He has offered me a viewing at 9.30 am on Thursday 26th July and I have accepted. I am very grateful to John Kinsey from JLL for his prompt response to my email, he replied the same day. He says I was mistaken in thinking that he had told me he had not been to the Drill Hall. The terms for the lease will be issued in the sales brief. So it would appear that despite the press release from EDDC (below ) the sales process has not actually begun yet. On the 12th July I wrote to John Kinsey, Hotels and Hospitality Director for JLL who is handling the sale on behalf of EDDC because the sale doesn’t actually seem to have got underway yet. On the 27th June 2018 EDDC put out a press realease announcing the start of the 6 month marketing period for non-commercial bids for the Drill Hall. Strangely they seem to think that from the 27th of June to the 11th January is 6 months! See below. Local community groups who may be interested in the site can approach JLL for guidance about the information required from them, if they want to put in a bid in six months’ time. The deadline for submitting non-commercial and commercial bids is January 11, 2019. East Devon is working closely with the town council on the marketing of the site. On the 13th Feb 2018 EDDC put out a press release setting out what will happen at Port Royal. I was surprised by this as the plans for Port Royal have not yet been approved by the full Council which next meets on the 28th Feb; but I am sure they know what they are doing! It is still not clear whether the building will be reused, I do wish they would be more precise. Cllr Jeff Turner spoke for the Town Council and said that the STC interest was with the Port Royal Club (that is the Sailing Club, Gig Club and Sea Angling Club ). This is not something which has been said before but it explains a lot. The Consultants had said in their report that the Sailing Club and other clubs who use the building provided facilities for a significant proportion of the population of Sidmouth. (Main report doc, 6.7, ‘The sailing club and the building it occupies clearly provides benefits for a significant proportion of the local community.’ ) I thought that this was overstating the case, how many people constitute a ‘significant proportion’? Now at EDDC Cabinet Cllr Turner points out that the collective term for all these clubs is The Port Royal Club, as head of the Reference Group why did he not make this clear to the Consultants? If that basic level of communication is missing then how much else got lost? Or is it that until now only the building was known as the Port Royal Club? ( as shown by the fact the term is only consistently used in planning documents ). I can not find a constitution or a company or a charity with that name or something similar, in Sidmouth. EDDC written minutes can be checked against the audio record. Neither the STC or EDDC minutes give much hope that the Drill Hall building is seen as worthy of being retained, so we need to keep up the effort! If the minutes are an accurate record then it appears that Sidmouth Town Councillors are wanting and expecting that the Drill Hall will be marketed as a building site. Their wish that a design for the site be ‘aspirational’ would indicate that they still haven’t grasped that rebuilding on that area would not be attractive for a developer, especially as such redevelopment would require the developer to contribute to the cost of the Beach Management Plan. The reports from the Consultants make it clear that there would need to be an archeological survey before a new building could be created, and I have written to the Councillors individually, in the past, to make the same point. The Consultants touched on the difficulties of demolishing and recreating within a Conservation Area, and you all know that this point has been made to the Town Council and District Council for many years. And so it goes on ….. I find it very difficult to believe that a majority of the Town Council is still in favour of a rebuild, which is what these minutes suggest. The East Devon Distric Council’s agenda for 7th Feb 2018 contains an item on Port Royal. In it there is a recommendation that the whole site is not redeveloped but that the Drill Hall is put up for sale. This recommendation may be accepted by Cabinet and then by EDDC as a whole, or it may not. If it is accepted there is still a lot of uncertainly about the form in which it will be marketed. Will it be offered freehold or with a lease? Is there the option for the building to be handed over to Sidmouth Town Council as an asset tranfer? Are they going to accept that demolishing the Drill Hall and building something in its place is never going to be viable, given flood zones and conservation issues, and require that the building is retained? Are they going to try to pretend that a buyer could acquire the site for redevelopment? If the latter is part of the plan then we need to challenge it early or we will end up in a situation where we and any developer spend a lot of time in getting the correct information understood, and any reuse of the hall will be further put back. The recommendation states that they want it marketed before there is further deterioration of the site. Would it be cruel to point out that any deterioration, past or future lies entirely at the door of the owner?